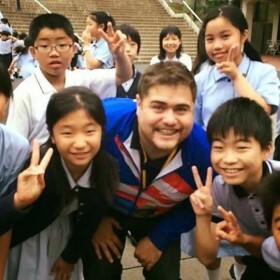 Albert Troche with a few students on his visit to a school while participating on the Academy of Leadership in Japan. In my determination to continue my professional, personal and academic development, I am among those who believe learning through experience. College life is unique and does not return and each experience helps you become a better human being. The opportunities offered at this stage of life are unparalleled. It is up to us to develop that leadership, which seeks to exploit our potential to the maximum. I have seen many friends expedite this stage to reach the workforce fast and running into the surprise that things are not that easy. The university is a goldmine that only a few have been able to exploit. Each university of our country has development opportunities for students to go beyond the academy. Though, many of the students just focus on the classroom, the library and maybe the cafeteria. Therefore it is up to us to discover the potential (hidden power) that our institutions possess. In my aspiration to discover that potential, I have participated in various organizations, committees and commissions of my institution. Thanks to these opportunities, at my young age, I have visited more than 10 countries in student experiences, either by student exchanges and internships with Scholarships. My growth in the university has been so big that since I graduated from my bachelor’s degree, I joined the Junior Chamber of Puerto Rico. This organization’s mission is “to provide development opportunities that empower young people to create positive change”. Among the opportunities offered by this organization is the Leadership Academy of Japan. The knowledge gained from the experiences at college, helped me have a good performance at this multicultural experience where I had to deal with more than 75 countries around the world which participated in the academy. I reflected a lot on this trip and realized that I have much to live, travel and learn. During the past two years, being part of the advisory board of the Hispanic Educational Technology Services (HETS), has added another experience that has given me tools for my academic & professional field. Knowing about the scholarships, internships and employment opportunities that exist at the Virtual Plaza platform has been very helpful for me and friends who are students of the member universities. Thanks to HETS I have visited more than 5 universities inside and outside Puerto Rico. I also shared with senior officials from these institutions. We the Student Leaders are always seeking opportunities for development and growth in order to make significant changes in our environment. I invite you to join HETS Student Advisory Committee, it will surely contribute to your student life in a very enriching way. Albert Troche, is part of HETS Advisory Committee since 2014. He is an Ed. D. Student at the Inter San Germán. In 2012 he was awarded with the John W. Harris Medal, and in 2014 was recognized as an honorary member of the International Honor Society “Golden Key” of UPR Mayagüez Campus. For more information about the HETS Advisory Committee, and how you can become a part of it, you can reach our office at 787-250-1912 ext. 2372, 2373 or thru email at info@hets.org.